The key to moving a tech venture beyond the start up phase is securing the investment necessary to fund the expansion phase. 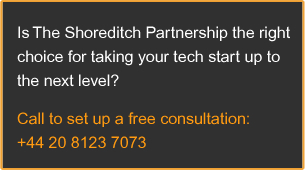 The challenge for tech ventures is attracting and securing the right kind of investors and The Shoreditch Partnership can help with the practical guidance and expert assistance needed to meet this challenge. Registered office and a list of the LLP members is available at the above address.